Artist Maira Kalman’s blog, And the Pursuit of Happiness, inspired a Monticello revisit. Do I remember anything from that elementary school trip? Don’t ask. Yet another example of Youth Wasted on the Young. (Then again, maybe the house imprinted itself on me, and I’ve been looking for it ever since, the same way ducklings can be imprinted by humans, and follow them quackily around…) Maira’s posts will be collected in a book, due next year, but they are archived online at The New York Times. Until then, her legions of fans and friends will be happy to hear that she has teamed up again with the incomparable--and prolific--musician Nico Muhly. He isn’t even 30 yet, and he has already collaborated with Phillip Glass and John Corigliano and Bjork; he wrote the film score for The Reader. Maira’s last book has inspired a song cycle by Muhly! I keep my copy of The Principles of Uncertainty on the bedside table in my guest room to share will all my visitors (propped open to an enticing spread with a rock, another reason to collect them). The last Kalman & Muhly collaboration was an opera based on Strunk and White’s Elements of Style, that classic volume dear to all English majors, an edition of which Maira illustrated…What will she think of next?!! Concert: June 3 at 8:00 pm, Atlas Performing Arts Center, Washington, D.C. 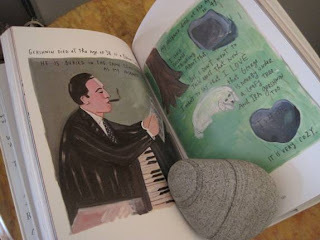 Many thanks for the link to Maira Kalman's blog - I didn't know it existed. I too keep "The Principles of Uncertainty" close at hand. Perhaps now more than ever, I need a reminder that the weirdness and contradictions of everyday life can be charming and funny. It's all how you look at it and how long you can keep one artfully groomed eyebrow raised! Thanks, Dominique, for your latest gift to all of us. Wonderfully refreshing, _and_ informative! But to either (or both) you and/or "Anna Z": inspired to learn more about Maira Kalman's "The Principles of Uncertainty", I 'went to' Amazon.com hoping readers' comments, and/or "look inside this book" (which didn't work this time around) would give me enough information to decide whether -- on my stringently belt-tightening budget -- I could ?"dass"? buying it. Seems there's considerable discussion about what kind of edition to get. The original publication, whose design distressed some and delighted others, or a subsequent differently-designed edition. Could one or both of you tell me your advice(s) on this? Would "mucho" appreciate that!